★★★★★ The Speed Pants look and work great, I have been regularly wearing them on my daily runs. Thank you for making a great product and for the great service. 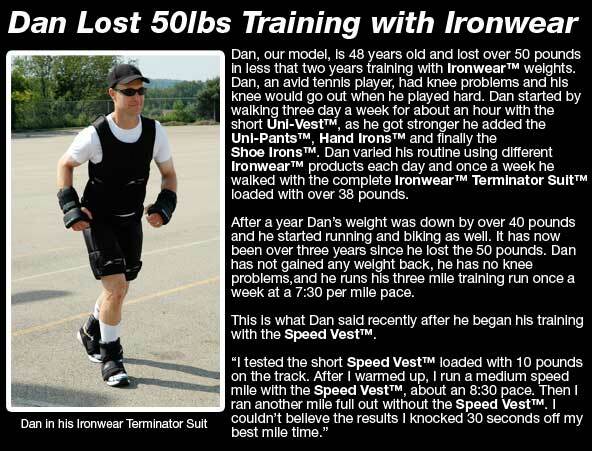 Speed Pants™ are IRONWEAR ™’s revolutionary new lower body high performance speed tool. This is a great patented system for building explosive legs, is a must for volleyball, basketball, soccer, football, and track athletes. And is great way to help the athletes train to lift their feet higher. Speed Pants™ ultra thin flexible design uses IRONWEAR ™’s patented soft Flex-Metal™ weights that fit into IRONWEAR ™’s patented mesh stretch pockets which hold the weight securely on all sides and let air pass through to keep the legs as cool as possible. Speed Pants™ are supplied at 9 pounds, but are Adjustable from 1 to 9 pounds by removing and installing the ½ pound Flex-Metal™ weights. 16 individual weight pockets are supplied with one ½ pound weight insert in each pocket. The pockets are designed to only hold one weight per pocket so that the weights are held as snug as possible and the weights do not move even during rigorous exercise. Speed Pants™ fit tighter and are more flexible that any other weighted pants. The thin Flex-Metal™ weights conform to the shape of your legs and become one with your body. Speed Pants™ are designed like a racing car, they are designed for speed. Uni-Pants™ are designed for durability, while the Speed Pants™ are designed to provide resistance with the least amount of interference possible, so that the athlete can push their limits. After training with Speed Pants™ athletes can fly like the never flew before. Speed Pants™ The sheer design allows for maximum flexibility and air flow. The patented mesh shell is like the tires on a racing car and they will wear out over time depending on the amount of abuse and miles put on them. Replacement shells are available at about half the price of the pants with the weights. Speed Pants™ open center design allows air to flow between your legs to help you keep cool. Other weighted pants designs cause your legs to sweat and overheat. Also the design allows you to quickly adjust the tension or release the thigh section to give the legs a rest, while keeping the pants on. This is an extremely valuable feature when training outside, when you may not want to stop moving or remove the gear. 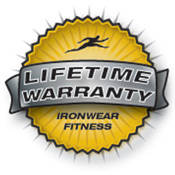 Speed Pants™ have IRONWEAR ™’s oversized patented Double-lock™leg belting system which prevents the weights on the legs from moving. The proprietary system allows them to quickly be adjusted to fit almost any 90 to 300 pound person, while still allowing the muscles to move, even during rigorous exercise. Speed Pants™ are the state-of-the-art in speed training. In addition to acting as weighted pants the Speed Pants™ can be connected to a wide varied of external resistances for pulling and jump training. 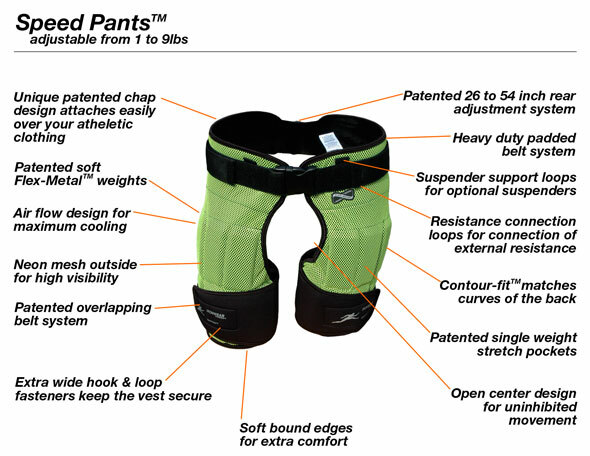 The design includes 6 heavy duty connection tabs around the belt for connecting to other support or resistance. 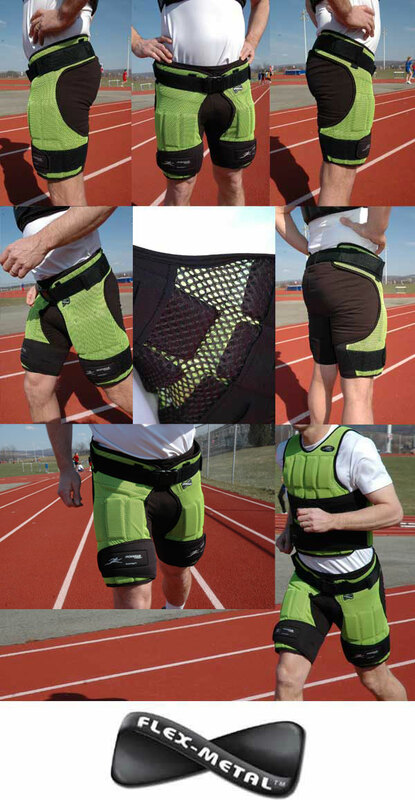 Speed Pants™ have a number of accessories, which are available separately, to make them even more valuable. Support Kit™ provides additional support for athletes with small waist and hips, to expand the belt and add extra padding and support for larger waists, to reduce stress and weight on the waist, and to allow the Speed Pants™ to be connected to external resistance devices for pulling and jump training. The system includes 6 connection rings, adjustable suspenders with shoulder pads, and a waist expander pad.